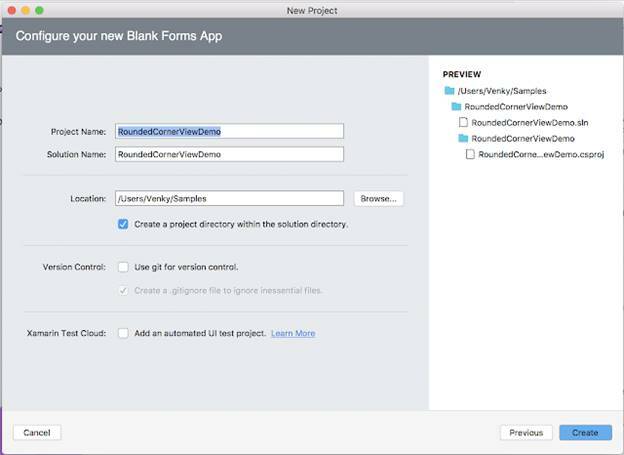 This article describes how we can set Corner Radius for Control or View or Layout. 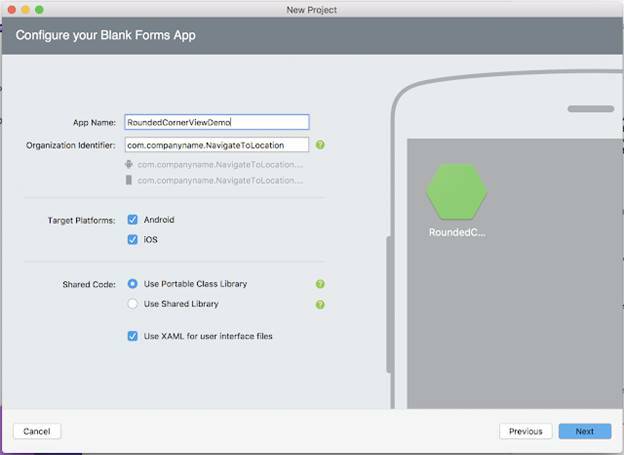 This article describes, how we can set Corner Radius for Control or View or Layout. Sometimes, we may get the requirement to set corner radius for StackLayout or Grid or ListView, in such cases I used to try to put View or Layout inside the Frame to make the corner radius, but, it was difficult to set all corner properties. So in this article, we can learn to achieve this functionality using CustomRenderer. 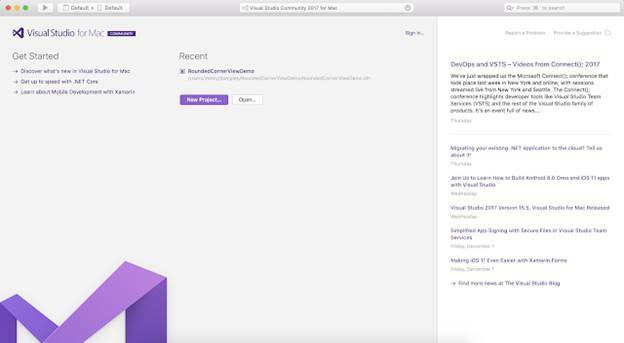 Because it's a Mac system with Visual Studio for Mac it doesn't support Windows projects (UWP, Windows, Windows Phone). 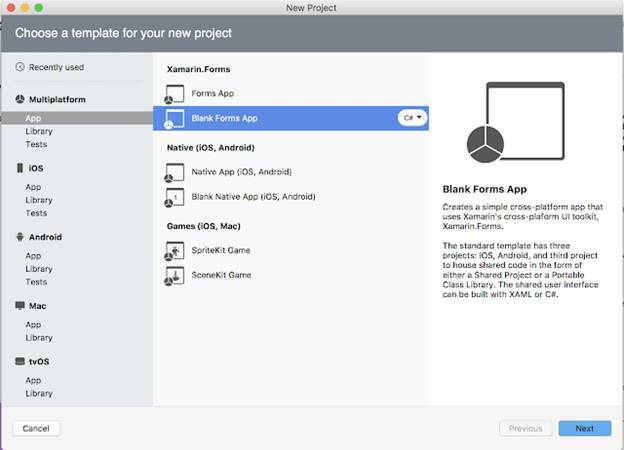 The following steps will show you how to create Xamarin.Forms project in Mac systems with Visual Studio. Then, we have to give the App Name i.e RoundedCornerViewDemo. Note: In the above screen under Shared Code, select Portable class Library or Use Shared Library. 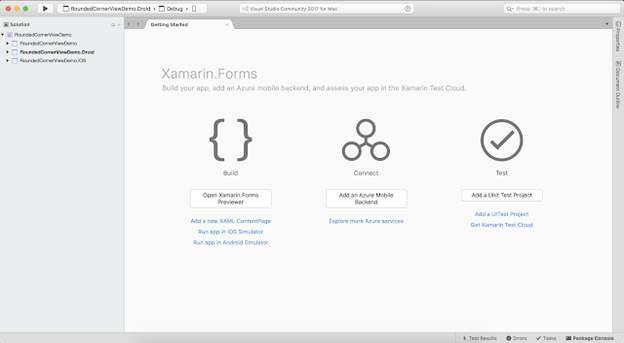 After clicking on the create button it will create the RoundedCornerViewDemo Xamarin.Forms project like this. RoundedCornerViewDemo.Droid: It is for Android. We need to follow the below few steps to make corner radius for the view. In PCL, create a class name as RoundedCornerView which should inherit any layout and this article inherits Grid Layout and adds BindableProperties like BorderColor, RoundedCornerRadius, BorderWidth, MakeCircle, FillColor. And here, we are trying to set rounded corner radius for ListView, so place Listview inside our custom renderer control, let's see how it makes corner radius. The "custom" namespace prefix can be named anything. However, the clr-namespace and assembly values must match the details of the custom renderer class. Once the namespace is declared the prefix is used to reference the custom control/layout. Add some simple data to bind ObservableCollection to the ListView in code behind. Also, here I'm not following MVVM design pattern. 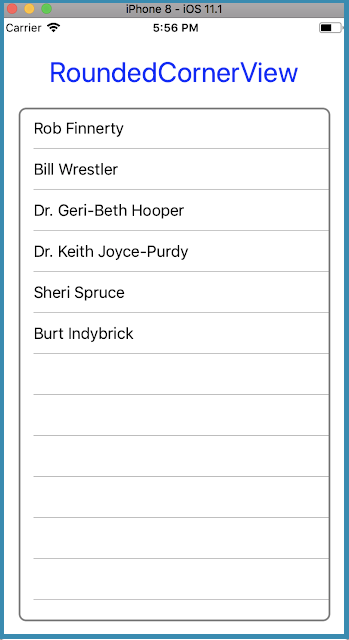 DisplayName = "Dr. Geri-Beth Hooper"
DisplayName = "Dr. Keith Joyce-Purdy"
In the above code, we made corner radius for ListView. But we can also set RoundedCornerRadius for any Control/View and Layout. // the same as creating a circle. // Draw the child first so that the border shows up above it. * with the border color. // Draw a filled circle. Here, OnElementChanged method instantiates an Android UI Layout. And also make sure to override DrawChild which is responsible for getting the canvas in the right state that includes BorderColor, BorderWidth, BorderRadius etc. Here, OnElementChanged method instantiates an iOS UI, with a reference to the layout being assigned to the renderer's Element property. In DrawChild method reference to the Layout is assigned to the renderer's Element property.